Led by the Friends of Starkweather Creek as well as support from the Schenk, Atwood, Starkweather and Yahara Neighborhood Association (SAYNA) and WORT-FM, the festival is a popular gathering for all to be exposed to new traditions and have an outdoor fire; also a Wisconsin tradition in cold times and warm. 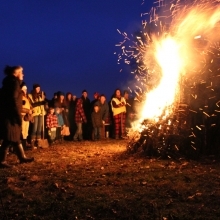 This day (December 22), the procession brought forth those chosen to light the fire after speeches were made welcoming the return of the light. As the fire was lit, around four to five drummers played tribal beats and many danced around the outside of the protective cordon of the festival fire marshals. The gathered pine boughs on the 10-foot tall pyre were very resistant at first and took several attempts, with a propane assist, to sustain the fire. Unseasonably warm weather, including a light onshore breeze from Lake Monona made the event an enjoyable time. As the fire accelerated, the spent pine needles streamed and floated from the fire like angry fire flies as they danced their way into the sky. Most assuredly cold dark days are ahead, but the fire provide a pathway to the light and warmth of summer. 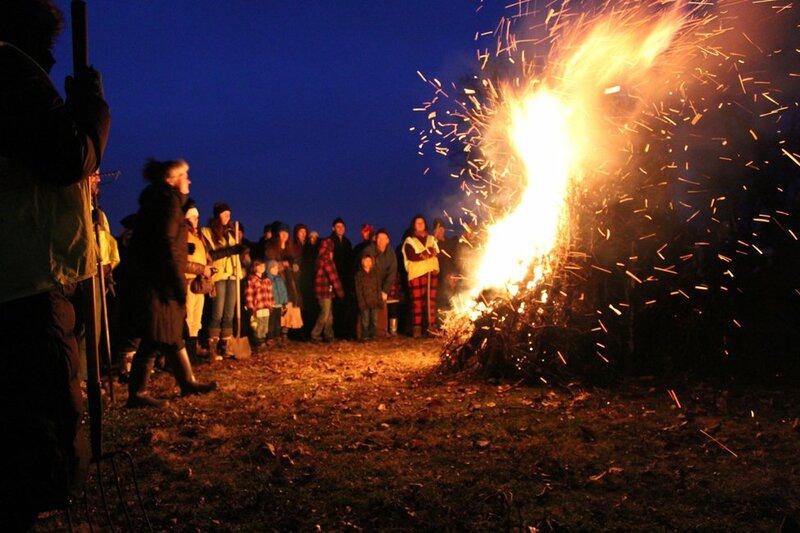 The Solstice bonfire gathers momentum during the 2015 Winter Solstice celebration at Olbrich Park on December 22, 2015. This entry was posted in Madison, Madison Arts & Entertainment, Uncategorized, Willy Street, Willy Street Arts & Entertainment and tagged Friends of Starkweather Creek, Madsolstice.org, Olbrich Park, SASYNA, WORT-FM by TheEastSider. Bookmark the permalink.